B1NGLY bong, bingly bong. bingly bong. Bingly bong. bingly bong. Ooo oooh Ooo oooh. For three decades Dr Who and its instantly recognisable theme music was an integral part of British television culture. But now the good doctor scourge of Daleks, Cybermen and numerous rubber villains — has found himself caught up in an acrimonious legal dispute between the BBC and a film production company. A consortium of three filmmakers and other backers yesterday said it was suing the BBC for more than £14 million after the corporation allegedly welshed on a deal for a film version of the series. The film which was never made would have been directed by Leonard Nimoy and have starred Alan Rickman. The production company, Daltenreys, issued a writ in the High Court yesterday seeking compensation for the £1 million already spent on production costs. The group also wants about £14 million to cover the loss of potential profits on three big-screen versions of Dr Who which it had planned to make. Yesterday the BBC said it would contest the writ vigorously. A spokeswoman said the corporation had leased the Dr Who rights to Daltenreys, but claimed that the rights had reverted back to the BBC when the film was not made in time. The three principals in the Daltenreys consortium --special effects experts George Dugdale, John Humphreys and Peter Litten --- negotiated the deal after the TV series was axed (or dematerialised, to use Who parlance). They were on the brink of casting Alan Rickman in the lead role in January 1994, when the BBC announced it was going ahead with a rival television movie with Steven Spielberg's company Amblin. The American movie, starring Paul McGann and screened last Easter, was brusquely dismissed by critics as a flop. "The simple fact is we have been ruined by the BBC," Mr Humphreys said yesterday. "They have behaved in a way that, even now, we find unbelievable." The consortium, which is backed by the singer Bryan Ferry, signed the original deal in 1987 with John Keeble, head of BBC Enterprises, now BBC Worldwide, but the agreement started to go wrong in 1993 when the company went to the BBC for final approval but found itself "obstructed and delayed", according to the writ. A few weeks before the rights deal expired on April 6, 1994, Mr Humphreys, Mr Dugdale and Mr Litten heard of the new agreement with Mr Spielberg. "We were devastated." Mr Humphreys said. "It was a bombshell." The good doctor himself, alas, was killed off by a BBC dissatisfied with failing audience ratings. Bingly bong. APA 6th ed. : Harding, Luke (1997-02-15). BBC faces £14m lawsuit after Dr Who film plan scrapped. The Guardian p. 8. MLA 7th ed. : Harding, Luke. 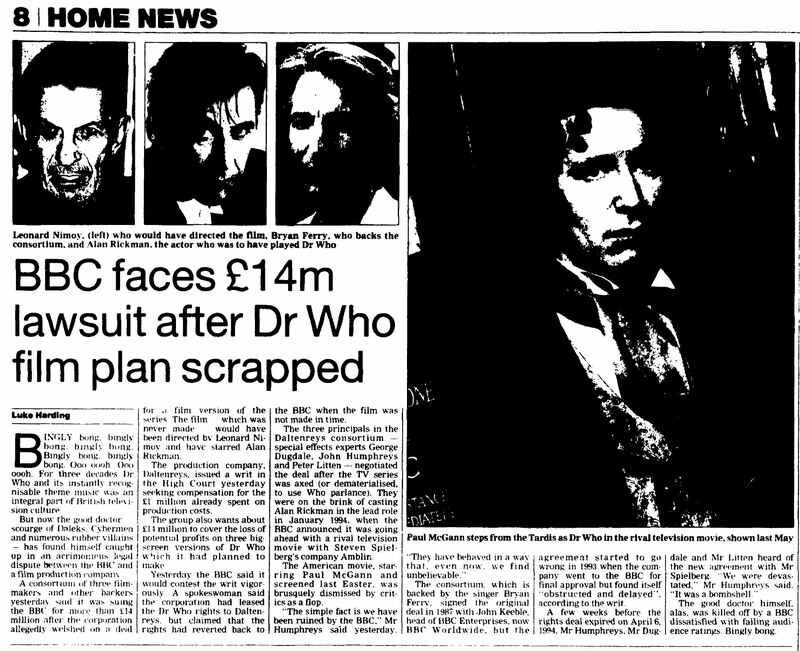 "BBC faces £14m lawsuit after Dr Who film plan scrapped." The Guardian [add city] 1997-02-15, 8. Print. Turabian: Harding, Luke. "BBC faces £14m lawsuit after Dr Who film plan scrapped." The Guardian, 1997-02-15, section, 8 edition. This page was last modified on 10 June 2014, at 22:40.